It's camping season! We haven't been out yet this year, but I'm very excited to get the kids into the woods. For the first time since we've had kids, I'm not feeling totally overwhelmed by bringing them camping. Yay! My family of origin loves drinking coffee around the campfire. I like this Single Shot K-Cup Coffee Maker by My Jo Brewer because it would allow us to make one cup at a time. The only requirement would be hot water and K-cups. There are so many varieties of K-cups these days that you could have options for everyone. Originally seen on The Popup Princess. I find this Portable Camp Kitchen very inviting and love the shelves for placing all the cooking stuff. If DIY isn't your thing, this store-bought camp kitchen is very nice as well. We usually have camp chairs with fold-up tables when we're camping, but I thought these Stake Cup Holders were very fun. You could also buy coil stake cup holder on Amazon. The mom behind these awesome Shower Supplies Lanyards does a lot of traveling and camping with her kids. She made these lanyards to go over the shower head. I love how everything stays together and would be harder to lose than if each piece was separate. I think these hanging travel bottles will work great when I make ones for our family. Cleanliness while camping is a touchy subject. Some people embrace the dirt and are satisfied with a quick swipe on their pant legs. Others are ok with baby wipes or hand sanitizer. While others are only happy if they can access running water and real soap. If you're one who needs water and soap, then this DIY Hand Washing Station is for you. It uses a water dispenser, a bungee cord, a paper towel holder, and a bucket for brown water. Sounds like a plan. Solar Chandelier and Candelabras are the epitome of glamping to me. And I think they're so fun! The one pictured uses a salvaged chandelier and solar lights. I think they would be a lot of fun for the deck, too. This family was tried of having the tissue box and the paper towel roll on the picnic table all the time, so the dad invented this holder. I think it's a great use of wasted space (although they may get dusty). This paper towel dispenser seems like it would work if you want to try making your own. If you want to keep the bees out of your drinks when you camping, then you'll need a cupcake liner and paper straw drink cover. It's so cute and cheery! Or you can buy the mason jar covers with straws that is also spill-proof. I'm not sure if mason jars and camping go together, but they sure look nice. These mason jar condiment pumps look like just the thing for hot dogs. A pre-assembled one is available here. When we were younger, we used to camp with a toilet set-up a lot this one. Well, ours was a big more rugged and made from PVC and a blue tarp (oh, the heat!). This Camping Toilet looks very welcoming, and is somewhat handicap accessable as well. You can grab a Coleman camping toilet on Amazon to go inside your changing tent. We're fortunate to live in an area of the country where there is little humidity and where the it gets cool, sometimes chilly, at night. If you're camping without that luxury, then you'll probably want to make this Swamp Cooler. As long as you can hook to electricity, then this fan-run system should work great for you. You can DIY using the previous link or you can buy a camo swamp cooler already assembled. This glamorous tent camping set up reminds me of an African safari. The luxury ones that you see in movies- not the camping-in-your-car one that my husband and I went on when we lived in Botswana. The bed in the picture uses an air bed and real bed linens to glam up their camping experience. I am obsessed right now with Tent Trailer Remodels! I just discovered The Popup Princess and spent hours reading the remodel stories. This camper was one of the first I saw. The owner used marble contact paper to make the counters and table look so trendy and luxurious. Continuing my camper craze, I thought this Wrap-Around Step Rug was a great idea. The blogger tells you how to DIY your own or you can buy official wraparound step grips on Amazon. We've carried pool noodles on our camping trips for as long as I can remember, but we never thought to use the Pool Noodle as a Gutter for the camper. One of my earliest camping memories was going up to my Great Aunt and Uncle's property and sitting under the party lights. They felt so magical to me. These Ping Pong Lights would be really fun to hang around a campsite or inside a camper. They even make battery operated lights for times when you don't have access to electricity. This Red Camper makes me want to buy all the red camping gear I can find and make a theme of it. So energizing. I thought these under the table drawers would be so handy for keeping all the little things that need a home. You can buy the drawer units from Amazon and then install them yourself. 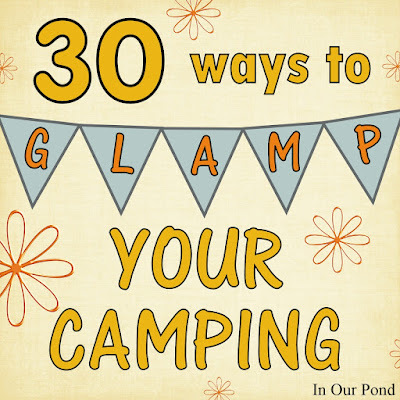 What's the number one thing that you don't want to lose while camping? Your keys! That's why these key hooks are so brilliant. I love that they kept right inside the door. You could use the cup hooks like in the picture or buy a key rack where all the hooks are connected. Either way, I think it's a must for every trailer or RV. There always seems to be so many shoes when we're camping, cause everyone needs at least a closed-toed pair and sandal. This shoe storage outside the trailer is a great idea. It uses a hanging shoe rack as the main organizer. The 3-drawer unit holds all the play gear. Camping means garbage, and garbage needs trash bags, and trash bags need a trash bag dispenser! This one could go inside the cabinet or you could buy this one to go over the door. This mini pantry might be more for RV's than campers, but I thought it was a great idea anyways. Be sure to secure the door well before driving. This slide out mini pantry seems like it would work well with some modifications. We camp in the mountains, so we have coats with us all through the summer. This coat rack looks like it would be very helpful. For those who don't need coats while camping, you could also use the hooks for hanging lanyards (like the shower ones from before), flashlights, or clothes. This over the door coat rack would be good for the set up in the picture. The end of the camp bed is wasted space, which is why this bed shelf makes so much sense. 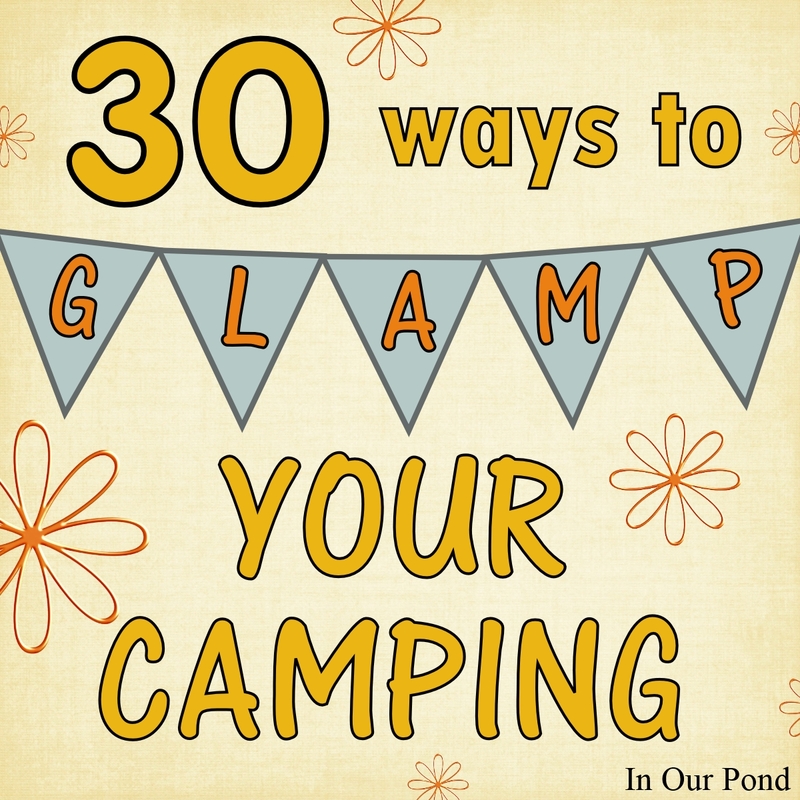 To see more camper organization ideas, check the link. This set is super adorable! It would make a great gift for a camping kid or a surprise for a rainy tent-bound trip. My kids love bubbles, and they would love these cute DIY Bubble Wands. Be sure to buy a big jug of bubble solution so that the fun can go all weekend. Gotta get the kids used to glamping early. This floaty bed is just the thing. You can buy your own mattress floaty on Amazon. I think my kids are officially too big for a set up like this, but we loved bringing our booster seat with us camping. It was great for meal times, but it was also good when you just needed them to be still for a few minutes. It may seem excessive for a backpacker, but I think the booster seat is a necessity for campers with young children. Although there are so many things to do while in the Great Outdoors, an Activity Kit like these is probably a good idea. And all these things come from the Dollar Store. Our very favorite all-time thing is glow sticks. We use them for everything! They make great flashlights or markers for dangerous places. Last year, I wrote a blog post about camping with kids. Check it out for more ideas- books, videos, toys, audiobooks, and more!